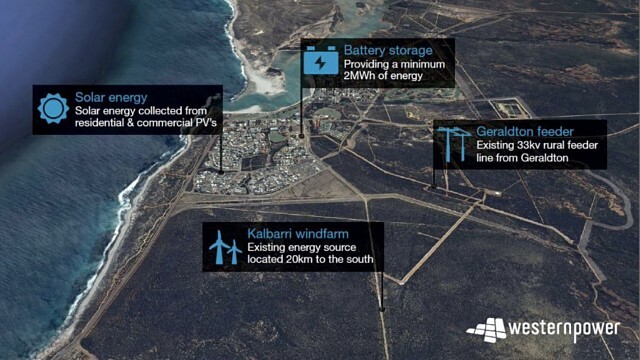 Home › Microgrid › Kalbarri microgrid: Carnegie to build. The long awaited Kalbarri microgrid will be built this year and launched in 2019, as Renewable energy developer Carnegie Clean Energy have signed a $6.8 million contract with state-owned Western Power to build a 5MW Battery Energy Storage System (BESS) in the area. According to the contract, Carnegie’s subsidiary Energy Made Clean will be teaming up with JV partner Lendlease services to build the sustainable energy storage system. It will be able to generate 4.5MWh and a minimum of 2MWh will always be accessible for backup services. The BESS facility will have two different modes – “Island Mode”, and “Grid Mode”, with the former allowing operation independent of the electricity grid. Grid mode will do what it says on the tin – helping provide network stabilisation for voltage and frequency to other generation sources. “We’re excited to have won an extremely competitive, global tender using the latest in storage and control technologies. This reinforces Carnegie’s leadership in the design and delivery of innovative energy solutions in Australia,” he said. “(this) contract award comes just over 12 months after the establishment of the EMC/Lendlease JV which has secured $25m in orders in the last 4 weeks with Kalbarri and our Northam Solar Farm. With tender cycles running in excess of 12 months, and a clear focus on delivery of high-value projects for utility grade customers, we are just starting to see the results of our hard work over the past year.” Mr Ottaviano continued. ← Large scale solar in NSW to explode in 2018.